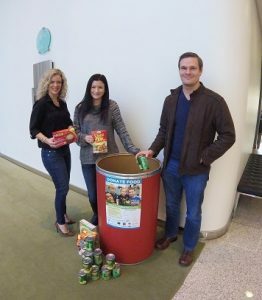 November 16, 2015 – DKI, North America’s largest disaster restoration contracting organization, today announced their remote office in San Ramon, CA is supporting its community through the Contra Costa and Solano County Food Bank’s Season of Giving Food Drive, sponsored by Sunset Development Company’s Bishop Ranch. Every year, the Contra Costa and Solano County Food Bank serves over 8 million pounds of food, feeding more than 188,000 people. Bishop Ranch, a business complex in San Ramon, CA, housing several companies, including DKI, is accepting donations of non-perishable food through Thursday, November 19 to support the Food Bank and its community of needy families. According to Bishop Ranch, the number of children in low-income families and seniors unable to afford food in the Contra Costa and Solano Counties has grown 26 percent in the last two years. DKI donated several bags full of canned vegetables, soups, cereal, and more non-perishable foods. “For those of us who are lucky enough to have food and roofs over our heads this holiday season, it’s important to stop and give back when we can. Even the smallest act of kindness can make a difference. Our entire corporate team is excited to continue to support those in need throughout the holidays,” said Dan Cassara, DKI’s CEO.